A modified version of the house originally designed by Stuart Ohlson is under construction at the Fort Lewis College campus. 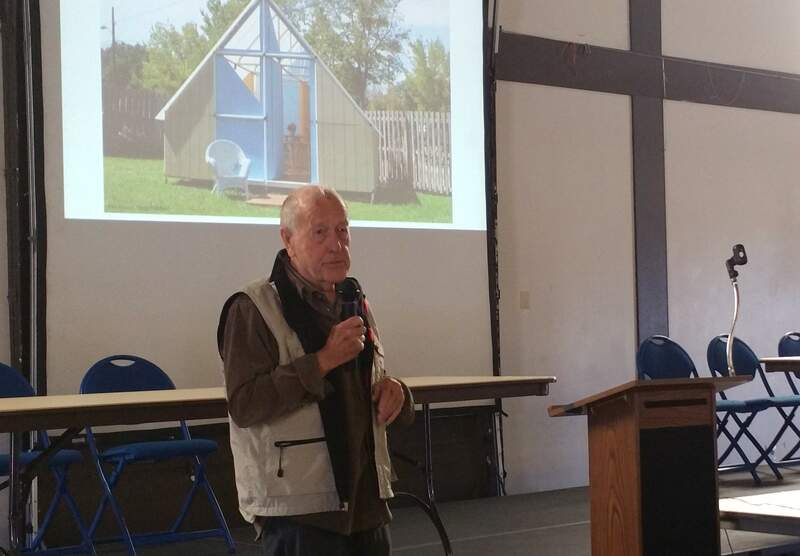 The house was discussed in detail at an all-day forum about ending homelessness at the La Plata County Fairgrounds on Saturday. Humanitarian House International Founder Stuart Ohlson talks about the home that he designed to serve people in equatorial areas after natural disasters have occurred. The structure is being modified by a class of Fort Lewis College students. It was one of the topics discussed at a day-long forum on Saturday at the La Plata County Fairgrounds. Fort Lewis College students are modifying a tiny home designed for equatorial climates for a mountainous environment. Tents, tiny shelters, temporary and permanent houses are all potential solutions to ending homelessness, an advocate said Saturday during a day-long forum on the subject. “Ultimately, we have to create lots of different alternatives,” said Don Burnes, founder and board chairman of the Burnes Center on Poverty and Homelessness at the University of Denver. Creating communities for homeless residents, such as campgrounds and villages, gives them safe, stable places to live and helps them reconnect with other people. “The single most universal characteristic of people experiencing homelessness is social isolation,” he said. What doesn’t work, he said, is criminalizing homelessness by enforcing camping bans because it forces law enforcement to chase the problem around because people have nowhere to stay. Burnes joined several experts who addressed a crowd of about 100 people at the La Plata County Fairgrounds. It was hosted by Community Compassion Outreach, a program of Durango Christian Church. 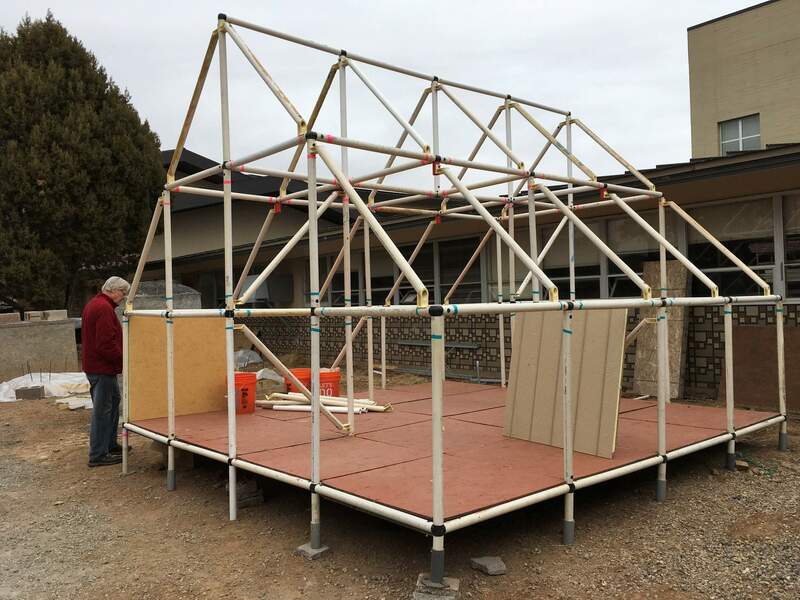 Fort Lewis College professor Don May suggested that a lightweight shelter originally designed by Humanitarian House International and meant to be constructed in two days with simple tools and transported in a regular truck could be a viable option. May’s engineering class is redesigning and testing the lightweight house originally designed for an equatorial climate, he said. They are also looking at how the homes could be designed to allow utilities as well as alternative designs. 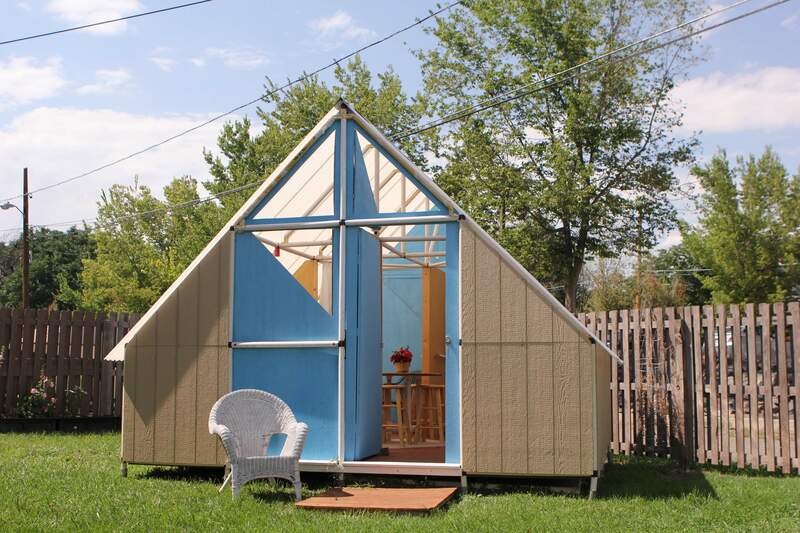 The goal is to keep the cost of the structure below $15,000 with utilities. May said the results of the students’ work will be ready in two months, he said. The original architect of the lightweight structure, Stuart Ohlson, said he hoped the structure would allow residents to regain personal pride, in addition to meeting building codes and safety regulations. “Pride and dignity and hope ... as an architect, those are very elusive,” he said. The houses could fill a village self-governed by the residents in Durango, said Community Compassion Outreach Executive Director Donna Mae Baukat. “We really want to build a very sensible family-type village,” she said. She envisions a village where people could rebuild their lives with the help of a mentor and wouldn’t face a short deadline to move out. It would be based on successful villages established in cities with challenges similar to Durango. Councilors and commissioners have discussed building a designated camp for homeless residents. But last week, city councilors pivoted to the idea of identifying scattered shelter sites instead. A chronically homeless man who has been living in the Walmart parking lot, Rick Bowhay, spoke at the forum Saturday about his personal situation. Housing surrounded by fencing may not work for everyone, he said. “That fence or that idea of a fence intimidates some people,” Bowhay said. Addressing a solution to homelessness can become divisive, but often, those arguing want the same result – to get people off the streets, out of parking lots or away from other public areas, Burnes said. Those living outside typically don’t want to be there, either. “Everybody basically wants the same thing. ... Why can’t we get all the sides together to work toward a common solution?” he asked. Nationally, the number of homeless people has remained stable for about 35 years, he said. Across Colorado, data from the U.S. Department of Housing and Urban Development show that homelessness is a growing problem, and counting the number of people who are homeless is difficult because some people are couch-surfing or living in their cars, not out in the open. An estimated 23,000 schoolchildren are experiencing homelessness in Colorado, Burnes said. In La Plata County, about 40 people between the ages of 12 and 21 are homeless or at risk of homelessness at any one time, according to data supplied by La Plata Youth Services. The total number of people in La Plata County without homes could be between 350 to 400, Burnes said. The conversation about homelessness, he added, often focuses on the moral character of homeless people, who may be alcoholics, drug addicts, mentally ill or panhandlers. But people who fit these stereotypes represent only 15 to 20 percent of the total homeless population, he said. The lack of affordable housing across the country is helping to drive homelessness. The country is short about 7.8 million affordable homes, Burnes said. In La Plata County, even when people have a voucher for federal subsidized housing, sometimes they cannot find a unit, said Brigid Korce, with Housing Solutions of the Southwest. Once families move into dedicated affordable housing, they tend to stay. “People are not moving out and up to homeownership,” she said. Housing Solutions is working on an application to receive tax credits to build an apartment complex with about 40 units near Manna soup kitchen. The housing could help people who need specialized services. But it will likely be several years before the building is completed, if it is awarded necessary tax credits. “Short-term, temporary options are very important to explore right now,” Korce said.